Ed is Co-Founder of Dallas Summit Volleyball club and Nortex Volleyball club. Where in the past 24 years has qualified 17 teams to the USA Volleyball Junior Olympic Championships. Ed is the Head Coach at Austin College where he has moved into the #24 spot of winning active coaches and #27 in all time wins for NCAA Division III. He has guided Austin College to six appearances in the NCAA Division III National Championship Tournament, advancing to the “sweet 16” round in 2005. His Collegiate record now stands 574-228 (.715 – winning percentage) and a home records of 208-39 (.842 – winning percentage). Since 2001 Austin College has been ranked among the top 25 teams in the Nation in weekly poll conducted by the AVCA and 13 of the last 14 years the volleyball team has won 25 or more matches per season. The Kangaroos have finished first or second in the American Southwest Conference Championship in eight of his ten campaigns. In 2005 Austin College won the conference tournament in their last year in the American Southwest Conference. In 2007 the kangaroos advanced to the Championship match of the Southern Collegiate Athletic Conference tournament where it was topped by the No. 3 ranked team in the nation. The 2007 team finished ranked 14 in the nation with a record of 38 wins, setting a new school record! Austin College reach 500 wins in program history during the Fall 2008 season. Garza has coached one first team All American, Four Second Team All Americans, six Honorable Mention All Americans. Two Freshman of the year in South Region AVCA, Three National players of the Week, Three – GTE Academic All-American Team, Two – ESPN The Magazine Academic All American Team and 69 players who have made All Conference in the last 20 years. Coach Garza has been named Coach of the year seven times in the American Southwest conference and in 2007 was named Coach of the year in the Southern Collegiate Athletic Conference too. 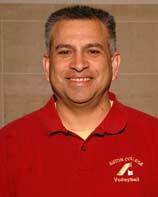 Before Austin College he served as head coach at North Lake College for two years Garza also served as an assistant coach at Henderson State University in 1989-90, plus he was an assistant at Ouachita Baptist University (his Alma mater) from 1986-1989. He has qualified Two Open teams, Seven American teams, and Eight National teams to the USA Junior Olympic Girls Volleyball Championship National tournaments. In the 2006 and 2007 seasons, his team has finished fifth while losing only one match each year. His 2008 team finished third to earn Garza his First medal at a USA Junior National Championship. He is also the Director of High Intensity Volleyball Camps which caters to youth age 10 -18 years old.